The SawStop Jobsite Saw Packs all of the safety of SawStop's revolutionary blade brake, plus the long list below of updated innovative features. 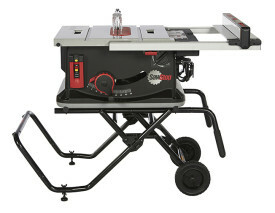 The Jobsite saw stands between a benchtop saw and a contractor saw and pulls benefits off of them both. The folding stand is easy to use, with a push of a button it goes from vertical storage position to being able to be used in cutting mode. 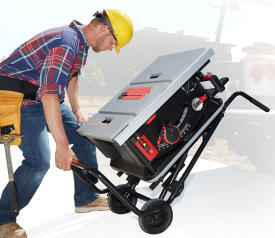 The stand comes standard 8" wheels that makes it easy to be transported throughout the job site no matter the terrain. With the table extension riding on the rail that slide out allows for a maximum rip cut of 25-1/2". And the Jobsite saw has Sawstop signature safety brake that will stop the blade immediately on the contact with skin which will reduce the risk of accidents in less than ideal job sites. One-Turn Blade Elevation: Other saws require over 25 turns to raise or lower the blade—with the Jobsite Saw, it's accomplished with a single turn! T-Style Fence with ErgoLock: Jobsite T-Glide Fence slides smoothly and locks firm with the innovative ErgoLock. 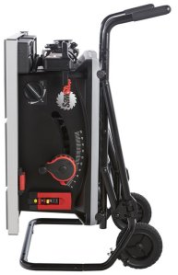 T-style design minimizes deflection to increase accuracy. Extend the OnDemand Shelf for support when needed. Tool-Free Zero-Clearance Insert: Quickly releases with no need for tools. Table Extension Clamp: Locks and unlocks easily, allowing you to quickly extend the table to a full 25-1/2'' rip capacity! Max. depth of cut, blade at 0º 3-1/8"
Max. depth of cut, blade at 45º 2-1/8"
Max. rip right of blade (extended) 25-1/2"
Max. rip left of blade 9-3/4"
Arbor diameter at blade 5/8"
Table in front of blade (max elev) 6"
Table behind blade (max elev) 7-3/8"
Hand wheel Effective diameter Ø6.3"